Our state-of-the-art surgical suite provides for the performance of a wide variety of surgical procedures. We offer most elective, some orthopedic, and many selected general soft tissue surgical procedures. All patients are carefully screened for safety via examination by one of our excellent veterinarians and through the use of diagnostic services, such as presurgical lab work, radiolography and ultrasound. Anesthetic protocols are individually tailored for your pet by our veterinarians. Patients are then monitored under anesthesia by our surgery technicians using multiple monitoring devices. 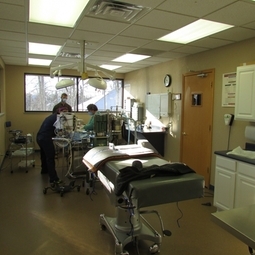 Each anesthetic case is treated individually, as each patient is different.